Malaysia is the biggest issuer of sukuk in the first seven months of the year, comprising 45% of US$9.3bil worth of new issuances, according to a recent report by Standard & Poor’s Rating Direct (S&P). 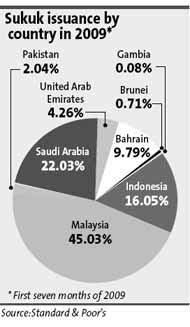 Saudi Arabia contributed 22% of sukuk issued for the same period. The total issuance, nonetheless, reflects a 20% drop compared with US$11.1bil issued in the corresponding period in 2008 due partly to the challenging market conditions and drying up of liquidity, as well as less supportive economic environment in the Gulf Cooperation Council countries, especially the United Arab Emirates (UAE). S&P expects growth in the UAE to be flat or slightly negative in 2009, down from more than 7% in 2008, mainly because of the country’s economic slowdown and the steep fall in oil prices. In the first seven months, the government of the Emirate of Ras Al Khaimah issued the only sukuk in the UAE, for US$400mil. Asia, meanwhile, has taken the lead in driving the expansion of the sukuk market with over 60% of issuance coming from this region. The first seven months of the year saw similar number of sukuk coming onstream versus a year ago, of about 70 issuances. Saudi Electric Co was the largest sukuk issuer of US$1.8bil. US dollar-denominated sukuk rose to 20% of total issuance, an improvement from only 10% of issuance in 2008, indicating the progressive return of the greenback as one of the main currencies for sukuk issuance. Sovereign-related sukuk still dominates the market, accounting for three quarters of new issuances in the first seven months. “Sovereign issuance will continue to drive market growth for the remaining months of the year because investors are shying away from corporate issuance in these turbulent times,” S&P said. Another major development this year is the default of several sukuks, including Kuwait-based The Investment Dar Co KSCC due to a general debt-restructuring programme, and Saudi Arabia-based Saad Group, which defaulted on some of its debts. The foreign research house said these episodes reminded investors that default could happen in the sukuk market. “The default of several sukuks was possibly partly responsible for the slowdown in issuance. On the upside, these defaults should provide the market with useful information on how sukuk will behave following default,” it added. S&P still views the pipeline for sukuk issuance as healthy as the market continues to attract interest from an increasing number of issuers in both Muslim and non-Muslim countries. It noted that several stakeholders were trying to reduce some of the hurdles that still impeded the market development of sukuk, like the Accounting and Auditing Organisation for Islamic Financial Institutions’ intention to screen products and services for syariah compliance and Malaysia giving legal status to the National Shariah Advisory Council of Bank Negara as the final arbiter. “These steps could increase investors’ confidence in the syariah-compliant aspect of the products and services,” the foreign research house said, adding that the creation of the Saudi sukuk and bond market under the Tadawul (the Saudi stock exchange) was another positive development.